Learn how to get Selena Gomez hair by curling it in this Howcast video, the first of a two-part hair tutorial with hairstylist Jacqueline Bush. My name is Jacqueline Bush and I am an editorial and celebrity hair stylist. My clientele has included Faith Hill, Mark Ruffalo, Terrence Howard, Gwyneth Paltrow, James Bukowski. I want to be able to show you hair isn&apos;t as intimidating or as hard as you think it is and I want you to be able to have fun with it and do what your vision is with your hair. I&apos;m going to show you how to get hair like Selena Gomez. Now, the difference between someone like her and Kim Kardashian is Selena likes her hair smooth, but I would say a little bit of a more traditional curl pattern than Kim Kardashian or Miley Cyrus. So, she already has a little bit of a curl. We&apos;re going to use that to work with us to get Selena Gomez hair. Now, one thing that is important is to get a lot of volume. So, when I put the iron through her hair I&apos;m going to hold these pieces to give it a little extra lift as we do our set on her. Now, another thing that you should notice is that I&apos;m going to use two different size irons. Because what&apos;s important is that when you use different size irons you get different sizes of curl, and that&apos;s difference between something looking effortless and something looking like you tried really hard. And Selena&apos;s hair, while it does look very glamorous and very traditionally beautiful it still has a certain feel of being undone and as if she didn&apos;t try too, too hard. So, that&apos;s achieved by using two different size irons. So, I&apos;m going to start the larger iron because I do like a little bit of smoothness, like Selena does. I&apos;m going to go ahead and start in the back section. Monica already has a little bit of heat protector on her hair. So, I&apos;m not going to put anything more in it, but if you want to you can put a little heat protector. You can even spray each section with hairspray. Because Monica&apos;s hair is fine I&apos;m not going to do that. So, I&apos;m taking my first section which is right at the crown. It&apos;s about an inch. I&apos;m going to take this piece, soak it, start at the base, roll up. Now, as I&apos;m holding this curl, I&apos;m very gently. In a very tiny motion, opening and closing that iron. 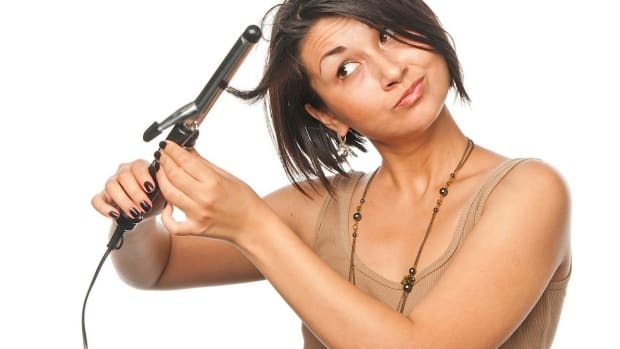 The reason I&apos;m doing that, while still rotating it, is that you won&apos;t get a crimp in the hair. So, now we have our first curl. So, to make it stay, you can put them in a little clip. I like to use these little clips. They give enough hold, and they don&apos;t dent the hair. And we&apos;re going to do the same thing, here and here. Just take a little inch section. If you want to spray your hair with hair spray do it right now. For this piece I&apos;m just going to use the smaller iron, just to mix it up a little bit. Opening and closing that iron, and feeling that hair on top of the iron to make sure it&apos;s hot. And I just keep it in there until it&apos;s actually hot. And there it goes. As you notice, see how the curls start to fall. I was holding that as much as possible because the hair is still really hot. So right now, because of the heat, it&apos;s very important to keep it in the shape you want it. Because as the hair cools it&apos;s going to stay in whatever shape you put it in. The next section I&apos;m going to do is just a little bit out an angle, just a little bit more to my left of her part. I&apos;m going to take my larger iron and I&apos;m just going to run that through. The reason why I didn&apos;t worry about curling those too much is because remember how I told you every curl is not done perfectly together. So, we&apos;re going to go all the way through the head, using two different sizes of irons, and also two different sizes of sections, or maybe even 3 sizes of sections, some small, some larger, some extra small. And we&apos;re going to keep curling from the base upwards. Now, the one other thing I want to tell you is as we go through the rest of the hair we&apos;re going to work in different directions. For example, we&apos;re going to take this section of hair, soaking the hair through the iron, curl it towards her face. It&apos;s pretty hot so I just wanted to protect her face and stick the pin in. And for the next one, I&apos;m going to use my smaller iron and I&apos;m going away from her face. So this one went toward her face and this one went away. So, I&apos;m taking my smaller iron, soaking it through, start at the bottom. The reason I didn&apos;t put that end in is because it already has a bend in it, there we go, slipping the iron out, holding this curl. Then on this guy here, this section I&apos;m going to curl it down. So this went toward her face, this one went away from her face, this one went down. And we&apos;re going to do that throughout the entire head, all different directions. It doesn&apos;t have to be super uniform, organized. Just kind of however you feel. This one, I want to be careful of her ear. Just being careful. Okay, so we&apos;re going to do this around the entire head.